The Department of Water and Energy, on 2 October 2007 advised High security licence holders within the Murrumbidgee Regulated Water Sharing Plan area were advised of an increase in available water determination (AWD) from 60 per cent to 75 per cent of entitlement. Town water increased to 70 per cent: The AWD for Stock and Domestic licence holders had also increased from 50 per cent to 100 per cent of entitlement and town water supplies has been increased to 70 per cent. These improvements were due in part to additional water from the Snowy Mountains Scheme which can now be delivered into the Murrumbidgee, and in part to inﬂows into Burrinjuck Dam which have receded more slowly than anticipated. End of monthly allocations of critical survival water: This increase triggered the end of monthly allocations of critical survival water for high security users, however there was currently still not enough water for an allocation to be made for general security users. High security licence holders may carry over up to 15 per cent of their unused entitlement into the 2008/09 season. Recent rain in the region is still well below average. All water users need to remain conservative with water use and encouraged to remain on level 3a water restrictions., Further information relating to the water availability in the Murrumbidgee Valley will be made on the 15th of each month via the Murrumbidgee Critical Water Communiques. These communiques are available from the Departments website http://www.dnr.nsw.gov.au via Whats New on the homepage. The failure of winter and spring rainfall was a disaster for the Murray Darling Basin, after successive years of drought. Water to Adelaide was so salted as to be of little value, and over 300 towns had no water, or severe water restrictions. Flow was down to 800 ML/day to Adelaide. “Very high salinities of around 13 000 EC continue to be recorded in the Goolwa channel upstream of the Goolwa Barrage”. David Dreverman General Manager of Murray river systems, in the Report For The Week Ending Wednesday, 26 September 2007, published 28 September, 2007 he said “very little rain fell over the Basin this past week, with the highest falls being in South Australia. River Murray continues decline: Along the Lower Murray there was 17 mm at Tailem Bend and 9 mm at Waikerie. Due to dry conditions in the catchment area, inﬂows to the River Murray System continue to gradually decline”. River Operations: Release from Dartmouth remains steady at 200 ML/day and the storage volume has increased from 656 to 664 ML/day (17 per cent of capacity). Snowy releases increase flows: Hume storage also continues to slowly rise primarily due to release from the Snowy Mountains Scheme via Murray 1 power station – and has increased from 844 to 857 GL (28.2 per cent of capacity)., Release from Hume reservoir has been increased to 2500 ML/day to target a ﬂow of 4000 ML/day at Albury/Wodonga. This rise will meet increasing downstream needs and will allow a further small rise in the level of Lake Mulwala. 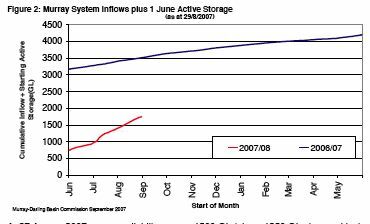 Lake Mulwala storage: Lake Mulwala has been raised from 123.7 to 123.8 m AHD over the past week and will reach about 124 m AHD by early October. It is expected that levels will remain at about this level over coming weeks but will be subject to changes in weather and demand conditions. Release from Lake Mulwala has been increased from 2600 to 3000 ML/day in order to boost declining river ﬂows further downstream. Torrumbarry Weir storage: Torrumbarry Weir pool is being used as a mid river storage and is currently being drawn upon to increase ﬂows downstream until the higher ﬂows from Lake Mulwala arrive next week. This has resulted in a temporary lowering of the weir pool from 86.05 to 85.9 m AHD. Euston Weir storage: Release from Euston Weir averaged 1840 ML/day this week but is expected to increase to around 2000 ML/day within the next few days as the higher ﬂows from Torrumbarry Weir arrive. Euston Weir pool cut from Murray: Beginning 1 October, the Euston Weir pool will be further lowered by around 3 – 5 cm/week in order to reduce evaporative losses along the river. Lake Victoria is now closed: The inlet to Lake Victoria is now closed ensuring that adequate ﬂow and weir pool levels are maintained in the River Murray at Locks 9, 8 and 7. Release from Lake Victoria has been increased from 1400 to 1600 ML/day and storage has fallen from 552 GL to 542 GL (80 per cent of capacity). Flow to South Australia: Flow to South Australia averaged around 1900 ML/day and although the ﬂow at Lock 1 temporarily increased to 1 500 ML/day it has since fallen back to 800 ML/day, Salinity rises at Morgan: Salinity levels at Morgan and Lock 1 have increased by about 50 EC this week and are currently 780 and 690 EC respectively. The level of the Lower Lakes has fallen from 0.25 to 0.18 m AHD since mid August with Milang Jetty showing an increase in salinity of around 350 EC to the current level of about 2350 EC. According to townspeople in Barmera, the State Government’s stoppage of River Murray water flow into Lake Bonney on Tuesday was the “death knell” for Barmera, reported Doug Robertson, in The Advertiser, (27/09/2007, p.18). Residents contemplate class action: Save Lake Bonney Group organiser Mark Beech, who ran Barmera Backpackers, said business people in the town were considering a class action against the Government for economic loss. He said Lake Bonney would be “dead” if the fresh water supply was cut off for several months. Supplies cut: Earthmoving equipment moved in on Tuesday, making a 20 metre “temporary” earth barrier across Chambers Creek near Nappers Bridge, about 5 kilometre from the town centre. The Government had cut off River Murray water at 27 sites. Govt defends action: State Water Security Minister Kaylene Maywald said discontinuing River Murray water from wetlands and lagoons was an emergency response to the drought. A controversial pulp mill planned for South Australia’s southeast would require more electricity than the giant Olympic Dam mine, the Greens claimed, wrote Nick Henderson in The Advertiser (25/9/2007, p.11). An Environmental Impact Statement (EIS) process would not necessarily have been the best way to examine the Penola pulp mill proposal, Souh Australian MHA R.G. Kerin said in the South Australian House of Assembly on 11 September 2007. One issue that was raised by a lot of people in connection with the planned Penola pulp mill was the issue of the licence for water to be taken for the mill process itself, South Australian MHA R.G. Kerin said in the South Australian House of Assembly on 11 September 2007. The Federal Government had set the example on water provision for the future, and the South Australian Government should get on with it, said Malcolm Turnbull, Minister for the Environment and Water Resources, in Federal Parliament (12/9/2007). The need to find further sources of water was the reason why, in March this year, the government commissioned the Desalination Working Group to investigate alternative sources of supplying water for the future, including desalination, South Australian Premier Mike Rann said in the South Australian House of Assembly on 11 September 2007. South Australian Premier Mike Rann praised South Australians for their water conservation efforts while giving details of eased domestic water restrictions to the South Australian House of Assembly on 11 September 2007. 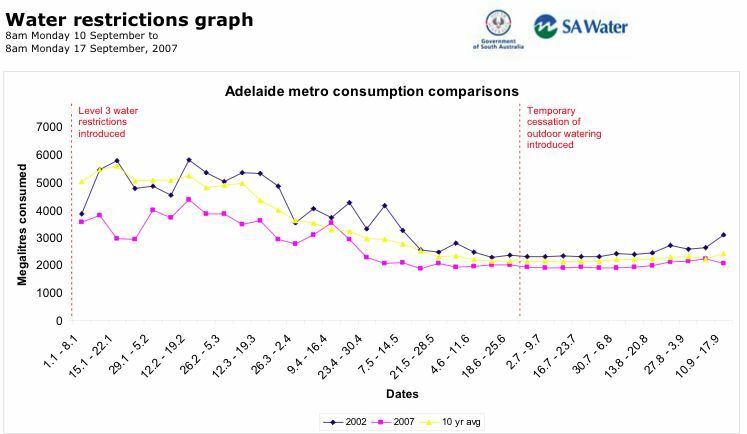 Water-levels below Lock 1 were projected to fall from their current level of 0.25m Australian Height Datum (AHD), to negative 0.6m AHD in April 2008. Under these projected conditions, massive fish death in the Lower Lakes is more likely. For the worst case scenario, water levels will continue to fall, reaching negative 1.5m AHD in the latter half of 2008. Salinity would rise and make what small irrigation water which was available, poisonous to crops and trees.